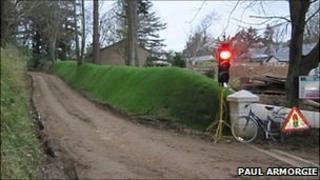 Temporary traffic lights are being used for the first ever time on the car-free island of Sark. The lights were placed on Dixcart Lane, which has a couple of blind corners along its 500m length and is wide enough for just one tractor at a time. The road has become busy as it is the only access to two hotels, both of which are undergoing renovation and refurbishment work. Cars are prohibited on the island. The lights will be removed in February. Paul Armorgie, director of Stocks Hotel, which along with Dixcart Hotel is undergoing work said: "The fragile earth banks on either side of Dixcart Lane were in danger of being eroded because tractors have being trying to pass each other. "The temporary traffic lights seemed the only sensible way to stop any lasting damage to the lane and to avoid frustration amongst the drivers." The lights will stay until the works are completed, which is due to be in February.